Click BUY NOW to register your group today! Register now for Saint David's Friends & Family Camp at the link above then pay by clicking the Buy Now button below. ​All signed up? Check out the attendees' information page. ​Some of your fellow parishioners grew up going on church retreats. And we exchanged some thoughts on things on Facebook. And then we decided to plan a retreat for St. David's. St. David's is now booked for a retreat at Westwind from Friday, April 26 through Sunday, April 28. 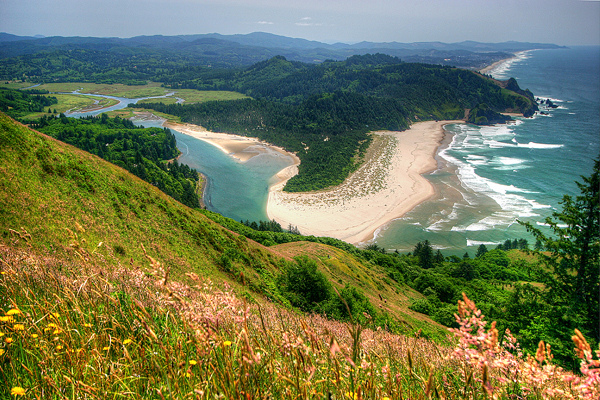 Westwind is a 529 acre camp and environmental education facility on the Oregon coast, bordering more than a mile of beach. The facility is run by the non-profit Westwind Stewardship Group. There are lots of questions! We have a few answers below to what we anticipate to be "Frequently Asked Questions" ... if you've questions that aren't answered here, please email Kieran Cannistra and she'll do her best to answer you (or get an answer from Matt Taylor, her husband, who also happens to be the Executive Director of Westwind). 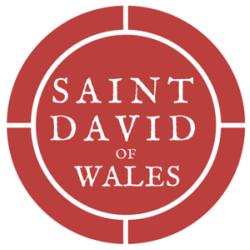 Q: Who is invited to the "St. David of Wales Friends and Family Camp?" We thought about calling this getaway a "retreat," but we didn't want to imply that we have anything to get away from. :) This is an inclusive, all-parish weekend getaway, designed to give us a chance to hang out as a community. By "friends and family" we mean all of you: the St. David's Family and your loved ones. Have neighbors you think would enjoy a getaway? Invite them! Do your kids have a friend they'd like to bring? Invite them! Thinking of coming alone? Cool! Want to bring the whole family? Also cool! In short: this non-retreat isn't designed for any one "type" of person. Q: What will family camp cost? 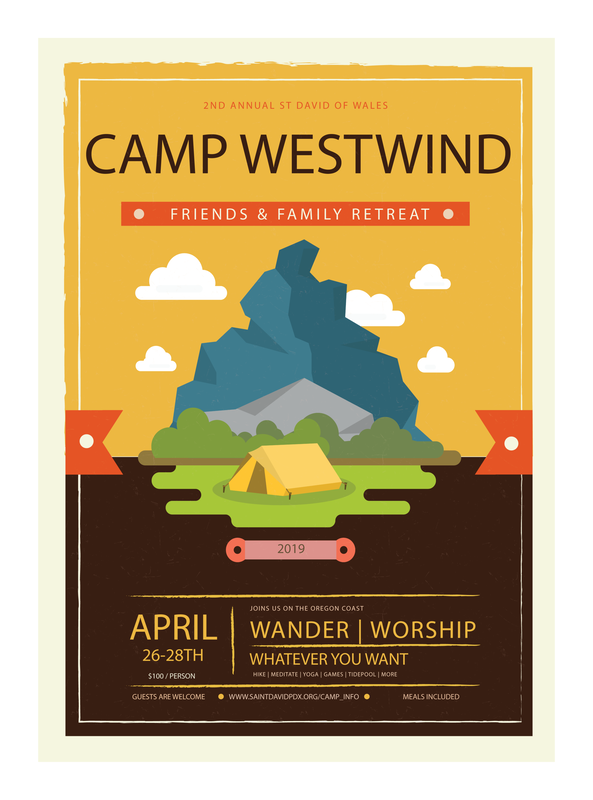 Because Westwind charges a flat fee for use of the entire camp, cost depends on the number of people who sign up. We are asking $100 per person. If you'd like to give a little more to help someone out who can't pay the full $100, we'll gladly accept. If you need to give a little less than $100, we'll gladly accept what you can pay. Q: What will we do? We're starting to plan things, but the short answer is: we hope to provide you with the opportunity to do whatever you'd like to do on a retreat. A few ideas are listed above (yoga, hiking, games, reading, campfires, church), but we'd love for you to either organize something or suggest to us what you'd like to do at Westwind with your fellow parishioners. Also: There will be no mandatory fun on this trip; if you want to hang by yourself in the woods, that is totally, totally cool. ​Q: How do we get to Westwind? It's takes about 2 hours to get there by car. We are considering chartering a bus for those who prefer not to drive; it will cost about $35 per person for the round trip. The traditional entry to Westwind is by a ferry across the Salmon River (it is super short - about 200-300 feet). You can also hike into camp (and will have to do so if you cannot make the ferry) from its Beaver Pond area parking lot; it's a beautiful two mile path (single lane gravel road) that hugs the Salmon River estuary through the coastal rainforest. A shuttle will be arranged for those who can neither hike in nor catch the scheduled ferry. Q: Where will we sleep? ​Westwind has twelve heated camp cabins that sleep up to nine and one cabin with heaters and a wood stove that sleeps up to 12. They share a common bathhouse (called, yes, "Cascade Head"). There is also a dormitory-style lodge with four bedrooms (four beds each) that share two bathrooms. This will be reserved for parishioners with special needs. Those who like camping in a tent are encouraged—there are boundless perfect camping spots in the dune forest or at the edge of the beach (and close to the Lodge and Cascade Head bathhouse). Generally kids sleep on the top bunks so that adults don't have to. Cabin preferences (if you would like to stay in a cabin with a specific person or family) will be worked out once registration is completed. Q: Do we need to bring our own bedding and towels? Westwind rents bedding (sheet, blanket, and towels), or you can bring your own. If going DIY, we recommend bringing your own pillow, sheet and a comforter or sleeping bag. We will strip beds when we leave. Q: Am I too [insert worry here] to go to Westwind and enjoy it? Westwind is rustic, but accessible, with more than 5,000 campers, students, adults and kids staying for 2 to 5 nights, each year. Westwind regularly hosts family camps for people of all ages, and is rented for weddings and other retreats attended by people of all ages. If you have a specific question or concern, please ask Kieran. Q: Will we have to cook? Q: What do we have to clean? ​Westwind adheres to a pretty simple "leave it better than you found it" ethic, and one way it remains affordable is that guests sweep out their own cabins, sweep and hose the bathhouse and sweep and tidy the dining hall and lodge community room. There should be little to no trash: Westwind efficiently recycles/landfills its food packaging and composts organic waste, and the only 'trash' will be whatever we bring that may need to be thrown away (diapers, candy wrappers, trash in our pockets).